Black Prophet is a gifted African reggae singer from Ghana. His unique, harmonious reggae beat combined with a glamorous African cadence offers a very distinctive sound to his rhythm. In 2003, Black Prophet made his first tour to Europe, where he played on various festivals in the Netherlands and Belgium. Since then, he has returned to Holland on a regular basis, backed by his Thunder Strike band. With his reputation growing further across continental Europe, he has been constantly invited to play at shows and festivals alike. 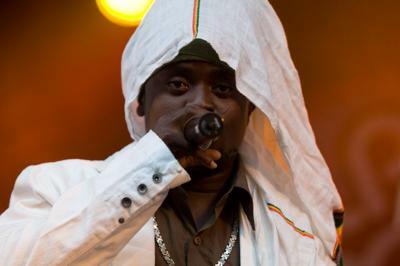 A very humble artist with a modest upbringing, Prophet is considered Ghana’s most prominent international reggae export. Prophet was born in Accra, and at the tender age of seven, he had his first public performance with the Ola Williams band. "The industry lives in me and I live in it. My music is to educate and elevate people from their slumber." During the 2010 European tour, he will showcase his newest single "Good Feeling" produced by world-renowned producer Dean Fraser during his first visit to Kingston, Jamaica in 2009. Prophet has toured extensively across the world sharing the stage with many international performers including: Rita Marley, Pliers, Don Carlos, Yellowman, Steel Pulse, the late Lucky Dube, Alpha Blondy, Buju Banton & Dean Fraser. Find Black Prophet on Amazon.MP3 and iTunes. Prophet please call me .i would like to meet you.but dont now where you are play soon.bless you my friend greethings opa .my number is.0617596277 .